White Tara is a beautiful meditation for developing kindness and compassion, increasing spiritual vitality and overcoming fears. She represents the feminine energy of the Buddhas. She is said to have originated from the tears of the deity Avalokiteshvara when he wept about the extent and intensity of the suffering experienced by all beings. The practice and teachings of White Tara will be valuable in everyday life and can help bring greater clarity, calm and inner joy. 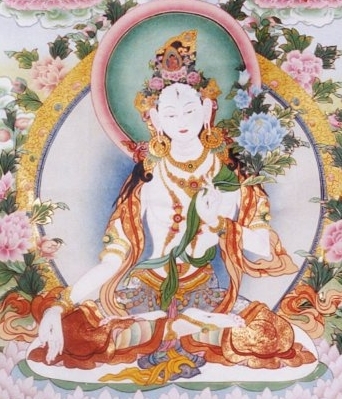 Students who receive the empowerment and undertake the practice of White Tara will increase their spiritual vitality, intensify their capacity for compassion, and overcome fears, including the fear of death. All basic Buddhist meditation techniques are included in the practice, with special emphasis placed on the creative visualisation meditations of Vajrayana Buddhism. The event is suitable for beginners and experienced practitioners alike. Please eat vegetarian on the day and contribute a small plate of food for lunch. Tea and coffee provided.